No 2017 was not a fun year, in fact our nation and our planet are now more at risk than anytime since the Cuban nuclear missile crisis in 1962 and it was almost all thanks to one man Donald Trump. Long ago I did a book with the title “Global Challenges: A World at Risk” That was in the 1970s and I did not contemplate an American president, let along a corrupt GOP Congress, would make our world not only filled with great dangers and risks but these would be accompanied by a serious threat to our own democracy. This may seem strange that I assess that Trump after the antics of 2017 is now one of our major risks both now and likely in 2018. The reason is very simple, in every new encounter, in every crisis, and even when there is no immediate crisis, his acts aim for the creation of even more upheaval and conflict. Thus the unilateral actions so far by Trump point toward even greater dangers for us all. On key factor in assessing dangers is the rationality and the goals and the temperament of those that are the decision-makers in any given crisis….and that means for most of the world Donald Trump, who stated main goal is “deconstruction,” (read creating chaos and harm), and that applies to almost every past great creation by the US to maintain the peace, democracy and cooperation. Note Trump’s deliberate destruction of our diplomacy tools and institutions and especially the gutting of the Department of State. The madness will end either when the GOP sees Trump as a liability and not an asset and the GOP billionaires agree and send that signal. Or perhaps Mueller finds the smocking gun? Otherwise they are tied to him and he is tied to them. The GOP created Trump knowing his craziness and, with malice aforethought, put him in a position to be president and supported his destructive agenda. And they took the money from the super Alt-right-wing rich and large corporations and stuck it to the rest of America. The GOP shut their eyes to all the horrors and nasty acts he undertook abroad that made others fear us and are now repulsed by America’s “new dictator.”Democracy is a risk as commentators Paul Krugman and Martin Wolf have already noted and many others. There is no shame in the Republican caucus in Congress. The battle for our nation’s values is also a battle for America role in the world. We will be reviewing in following forthcoming posts each of the key challenges that likely confront America and provide some insight into both likely added dangers and avenues of progress that hopefully we should take. Trump was against the Iran nuclear deal and he decertified the accord and left the use of sanctions to Congress but one motivation may have been to get others to take dangerous action that would have taken the blood off his hand in case of war. that would have moved the Iranian government to withdraw from the accord and certainly then justify using a military option with Israel with us taking the brunt of the action. As I have written and many other who are experts on Iran and on nuclear strategy and risks know tht the “nuclear deal” is in fact getting Iran to sand down on production of nuclear weapon was a major gain which safeguarded as most former Israeli security senior officials agreed made their nation safer. It is clear the rest of the key world’s leaders and military share that view including our close allies. Where in 218 will we see change and what should we do. First and foremost we should not pull out of the Nuclear Deal accord that would not only harm the security of Israel but involve us unnecessarily in a major conflict involving Iran and most of the Middle East with great damage to a vast array of American interests and with catastrophic deaths of innocent people and exacerbate the existing conflicts of the region. The last thing the Middle East needs is even more bloodshed. In this connection we need to change course entirely and pull back from a partisan position of favoring the Sunni position with Saudi Arabia in the lead and return to our effort to fine avenues of cooperation and reconciliation between both Sunni and Shia. That will not be an easy task and will need the cooperation of the few wise leaders in the region and others outside. But for the long-term it is a necessity. The most recent unrest and protests in Iran is an indicator of much sense of isolation and economic decline by the poorer sector and even some disaffection by the middle class educated for reform and especially the need to share in any prosperity. Ironically these protects threaten both the old guard regime of the Ayatollah Ali Khamenei plus his Revolutionary Guards who have now been called out according to recent reports. But the upheaval also threatens as well the somewhat more moderate and modern government of President Hassan Rouhani and most experts seem to accept the outcome will be bad in that the Revolutionary Guard, that as reportedly has now been deployed to put down the unrest with what can only be a disaster for all. When will the leaders in the Middle East recognize that their religious and power conflicts will only result in all sides paying a very dear price? Trump efforts, in fact are not likely done to support democracy but rather to stimulate added instability and cause as he has done elsewhere chaos which is his signature accomplishment. America must do better than that and work as we have for decades seek peace. RUSSIA’S PUTIN AND AMERICA’S TRUMP: A DISASTER TRAJECTORY FOR OUR NATION? We are coming closer and closer to some kind of determining of the trajectory of both the Trump regime at home and the direction and risks of the inherent divide between Putin’s Russia and its goals and Trump’s own goals or perhaps just incoherent daily utterances and thoughtless unknown schemes. For America this landscape is filled with unknowns and ever growing risks. If we continue as we have with Trump, the ending will likely be danger of more conflicts and with more calamities for both sides and the rest of the world. For Trump, the world is closing in and his walls of defense are increasingly more desperate and self-contradictory. His efforts to change the direction of attention away from the Trump-Russian contacts and towards diversionary issues confirm his sense of vulnerability. This includes the intensity of his incoherent tweets and acts that indicate at least that he senses serious risk for him, his family and administration. He perhaps sees a point of final dangerous conclusion by the Special Counsel investigation and Congressional inquires. To put the situation simply, the Trump “walls” are starting to crack (and we do not mean the non existent one on the Mexican border). All of this is solely due to Trump’s own nefarious behavior, his conflicting lies and those of his family and staff. Now we have proof of real collusion between Russian agents and the Trump family and staff according recent reported news on the now infamous Trump Tower meeting. This meeting was held clearly to work with the Russian government to influence the 2016 election. The meeting was with a total of eight persons, some with questionable backgrounds. It was focused much more on helping Trump’s election than Trump Jr. reported to the public or US officials originally. The fundamental question that must be in the minds of those alert to the legal and national security implications is that of collusion. The recent revelation of this meeting and that lies were told about it includes the fact that Trump’s son and people were offered Russian government information as a key inducement. And Trump Jr., in response to the offer said that he would “love it.” Trump Jr. did not put down initially all the people in the room for his security clearance. That in normal times would bar him from access to high level classified information. The recent revelation of Trump’s “private” and unannounced meeting at the G-20 dinner for about an hour with Putin with only a Russia interpreter present and no American interpreter, has raised many serious questions, not least about Trump’s primary loyalty and judgement. This is, even more so, as it may have been planned earlier with Putin to assure no Americans would know what was agreed. And we note that Putin had a briefing paper and pen at hand and Trump had nothing! We have had no real readout of what was discussed at this lone bilateral. Further we initially had strained obstruction regarding getting information on the heart of this meeting by the White House staff. I can assure all readers, as a former White House staffer and Member of the Secretary of State’s Policy Planning Staff, this was not normal if substance and deals were discussed and there was no planning or debate by officials on what Trump proposed. Efforts to make little of it only reinforce doubt. This was likely a very BIG DEAL! That there was no serious readout of the meeting only intensifies the feeling America may be sold out by our incompetent and unstable president. Does anyone who should be brief on this discussion really know what was agreed? Perhaps his family knows, or others in the White House or the Secretaries of State or Defense??? Or just the Russians? One further question: is there other material, likely in the hands of the intelligence community or FBI, which should be shared with Special Counsel Robert Muller? If there is full sharing, we may see the start of far more serious inquires by the Special Counsel who already has asked to interview at least one member of that Trump Tower meeting and reportedly more. At this time — with the President at the lowest point in public opinion polls and with a history of vitriol and lies in almost all that he does — the question is being asked if this nation can stand and be secure for the next three years with this individual and his “disruptive” family and staff. Not least in this regard Stephen Bannon with his Alt-Right views, seems increasingly to be behind some of the more cruel and hateful policies of this administration. Some say impeachment is not possible with this GOP dominated Congress which itself says a lot about how our democracy has declined and the integrity of our elected GOP officials as well. Think what the GOP would do if all this was done by a Democratic president? So many have been bought (literally in many cases), by dark wealthy forces wanting to undermine our democracy’s efforts towards fairness, equality, and justice for all. How many disasters will the GOP accept before acting? Thus the issue is likely in the brave hands of the Special Counsel, the FBI and our overall justice system. As Robert Mueller and staff examine the case for civil and criminal action against some in the highest levels in our land we many be able to discern who may have desecrated and shown they are disloyal to our constitution. We also need to thank some in the media who have exposed with courage much of the nefarious dealings of this administration. Donald Trump is soon again going abroad and if this trip is like that of his earlier Europe trip this Spring with considerable maladroit and indeed dangerous statements and behavior with our allies not least at NATO, then the coming journey seems to be not much better. As others have commented, Trump seems increasingly detached from reality and rationality and taken a turn towards irrational bullying and acting beyond normal. The leaders abroad have taken note! This has already alarmed many Americans according to a recent USA Today/Suffolk University poll and another by Pew. One shows alarming lack of trust in Trump by Americans and another show decrease of respect by people abroad for America likely due to Trump’s behavior. These polls are confirmed by a recent Quinnipiac University poll, where respondents were asked what word immediately came to mind when they thought of Donald Trump: The No. 1 response was “idiot.” This was followed by “incompetent,” “liar,” “leader,” “unqualified,” and finally, in sixth place was “president.” In addition, superlatives like “great” and a few unprintable names came down on the list. Looking at his behavior and his words and impulses and the mean spirit that is behind his actions, raises questions of Trump’s stability which in turn diminishes America’s leverage abroad and respect. Looking at the forth coming trip to Europe there are many pit falls and areas of sensitive issues and concerns in Europe. To say that Europeans are looking at this visit with some disturbing thoughts is an understatement. The key problem is some think Trump’s efforts will be to divide Europe and thereby strengthen Putin and Russian power in the region. The first reason for this concern is that the initial meeting in Europe, little recognized by much of the media, is to an Easter European bloc of nations under the invitation largely of the far right wing and authoritarian and anti-EU government of Poland rule by the infamous Law and Justice (PiS) party. In this First part of Trump’s trip is a meeting with a gathering of political leaders from Central Europe, Baltic states and the Balkans that has been called the “Three Seas Summit” which indicates the geographical range of its participating nations. While billed as an event convened by Poland to bolster regional trade and infrastructure within the group, others see it as a mechanism by Poland to create an Eastern Europe bloc against the Western European EU leadership and to weaken EU ties and unity and gain support against EU efforts to signal out Poland for its anti-democratic and human rights violations. So the Poland visit is filled with traps for long held American interests in keeping Europe united and committed to the EU, NATO and democracy and human rights. If Trump take this meeting as another opportunity to criticize the EU or NATO members over added payments for defense, it could end up being, as the earlier trip to Europe, becoming a new Trump debacle. His support for right wing racist and Fascists parties that oppose the EU is part of that concern. The meeting in Hamburg Germany of the G-20 group of major nations this coming week is another opportunity for Trump ideally to unite the G-20 nations towards cooperation on trade and international financial issues and affirm American engagement towards co-operation. But much of the focus on the Hamburg visit is the side-bar meeting with Russia’s Vladimir Putin which as both American officials and the public are much concerned that Trump will act irrationally and with views against American security interests. A face to face meeting could amount to nothing and be just pro-forma, but it could also be historic if dangerous “deals” are made without consulting his expert officials and without consultations with our allies. The background of this meeting is the investigation of Trump’s campaign associates in what may be collusion with Russia on sanctions over Ukraine or even the hacking of American election documents and efforts to push Trump for president and against Hillary Clinton as found by our intelligence agencies. In any case the meet is filled with foreboding. One of the problems will be how the leaders of the Group of 20 will be looking for leadership from America and Trump. Will it be a stable leader with intent to share efforts that are beneficial for all sides or a confronting “America First” tawdry president who will only further the de-stabilization of our globe by his challenging sands and rejection of decades of coordination and shared interests with our friends or strange actions that further hurt American leadership? Some have suggested that this trip is an effort to create a distraction (as some think is the case with the Trump effort against MSNBC’s Morning Jo affair), from the congressional and inquires into Trump and his associates dubious connections with Russian agents, lying under oath, and possible obstruction of justice. All of this seems to have unhinged Trump and made him vulnerable in the planned meeting with a more knowledgeable and experienced Putin. At this moment we do not know exactly the context or the issues they will discuss, but likely Syria, Iran, disengagement, North Korea, Ukraine, sanctions and efforts at disruptions of our elections and democracy. There is a lessen to all of us who worry about the direction that humanity is moving and not less what direction America will go in the future. This day we honored a man that indeed did “make America graet” in the yes of all at home and abroad. America has been the acknowledged leader of Western and other democracies but that is now threaten by the irresponsibility and venomous statements and threats made already by Donald Trump. Not least on this day we honored an extraordinary man filled with a commitment to equal justice for all, the elimination of racial and economic exploitation and prejudice, and especially committed to democracy and peace. But Trump, with malice afore thought, once again spudded disparaging remarks to a person with a morality that Trump it seems will never understand. Lewis said he did not consider, what many others believe, that Trump is “a legitimate president” and he gave as the reason Russian operatives interfered in the election on Trump’s behalf. Given that and the action of the FBI, Trump won with a profusion of outright lies, and that Hillary Clinton won nearly 3 million more votes, seems to not be a very strange conclusion among a large segment of Americans. Trump we all know in this context, is the man who disparaged Sen. McCain as a prisoner of war, a Gold Star family, a disabled reporter, and a host of just good people beyond numbers to count. So his nasty words directed at a good man with great courage who marched with MLKJr into dangers for the sake of justice and racial equality seems sadly no surprise. I feel this insult and nasty disparagement especially strongly because, in the smallest possible way, I also participated in our civil rights era by going South on Spring break conducting sits-in with fellow students, my Chaplain, and above all bravely by local African-Americans all under the banner of the Southern Christian Leadership Council (SCLC) led by Rev. King. It was not much but I was beaten with cattle prods by the St. Johns County police trying to sit-in, held in jail with my fellow peaceful protestors and threaten with death by the head of the local KKK inside the jail, the leaders of which were in cohorts with the police. Much worse I add was mete out to the local Blacks over the years. All the while Trump made sure to discriminate against African- Americans in his New York housing operations. Now we see the same mind set of hate for “the other” coming back and extending to just about any who dare to criticize him or have a different viewpoint. More on this element when we examine soon Trump’s MLKJr day attacks on our allies and praise and irresponsible national security giveaways to our adversary Vladimir Putin, the brutal killer of innocent babies, woman, and men in Syria and military aggressor in Ukraine on which he offers to lift sanctions. All in a typical day for a unsound Donald Trump. This would be an unprecedented action by any American political leader, as direct contact between national leaders should be conducted by the current President of the United States. By dealing directly with Trump as President-Elect, he would be undermining the executive power of President Obama during the final days of his second term in office. We have previously discussed Trump’s uncomfortably warm view of Putin, expressed by his encouragement of outside forces hacking the DNC and refusing to credit Clinton campaign cyberattacks to Russia, despite confident official announcements by the US intelligence community. Trump’s employment of advisers with close connections to Putin and his allies and suspicions of potential business ties to Russia also raises concerns that a Trump Presidency would provide Moscow with a foreign policy carte blanche. This Presidential election has been filled with many shocking firsts, including Republican party support for a candidate who seems unable to criticize an aggressive Russia that violates the sovereignty of other nations, undermines our democratic process, and indiscriminately bombs civilians in Aleppo. It’s hard to imagine the party of Reagan, who declared the Soviet Union an ‘evil empire’ and spurred a dangerous game of atomic chicken through a horrifying nuclear arms race, would throw their endorsement behind a candidate that fondly looks up to a former KGB and current authoritarian Russian strongman. Imagine if President-Elect Obama met with Dmitry Medvedev in December 2008 to discuss arms reduction plans. The Republican Party would have called Obama an aspiring tyrant and secret Russian apologist, undermining President Bush’s efforts to conclude his foreign policy legacy. THE FINAL DEBATE: THE LAST DISTORTED WORDS OR MORE TO COME? The last campaign 2016 debate was, as expected by some, was a horrific mess but it exposed again the terrible reality that Donald Trump is a dangerous man if not likely with an unbalanced and offensive mind too. And that leaves aside even much of his reprehensible words and behavior. Much of the debate was silly and often off subject and not very deep. Wallace was probably among the worst moderators I have ever seen in not pressing on the topic and keeping people talking over each other. Once again Hillary Clinton showed her firm grasp of some of the key issues that we face in our high risk world with all its complexities. But just fifteen minutes were not enough to give time to dig deeper into so many issues that needed better time and more depth. The Fox moderator Chris Wallace did not help matters in keeping on topic and challenging both candidates to not just say what they wanted to accomplish but also just how. He also let Trump go on despite the rules and interrupt Clinton while not stopping Trump’s interference. Defeating ISIS or Islamic State was an issue that was more assertions than strategy, limited to saying they will be defeated in battle, or asserting who is tougher or more fearsome. The reality is the President Obama strategy of providing help in terms of air strikes, intelligence, logistics, training, and other assistance without putting too many U.S. troops in to do this job and keeping them away from direct combat. With this strategy, in fact, some real progress has been made by relying on local forces who know the “terrain” better than we ever could. The salient question is not now whether they will take Mosul but when and how and what will be left and how can we put this shattered place back together and get the people to cooperate no mater their ethnic or religious background. The aftermath is key to long term security and stability of the region. The same is true in Syria. But little time was addressed to this topic. Displaced persons and refugees are a horrendous problem and we and our allies including the Gulf states have not done enough to deal with this problem. Nor did anyone really address the question of the role of Putin’s Russia now and later in the region. This is a major conundrum for not just for America but our allies and the Islamic states of the region. Here Wallace was weak. I think that is an idea that is not in keeping with who we are as a nation. I think it’s an idea that would rip our country apart. I have been for border security for years. I voted for border security in the United States Senate. And my comprehensive immigration reform plan of course includes border security. But I want to put our resources where I think they’re most needed: Getting rid of any violent person. Anybody who should be deported, we should deport them…. Clinton: “It’s pretty clear you won’t admit…that the Russians have engaged in cyberattacks against the United States of America, that you encouraged espionage against our people, that you are willing to spout the Putin line, sign up for his wish list, break up NATO, do whatever he wants to do, and that you continue to get help from him, because he has a very clear favorite in this race. Trump: She has no idea whether it’s Russia, China, or anybody else. Clinton: I am not quoting myself. Trump: She has no idea. Trump: Hillary, you have no idea. Trump: And our country has no idea. Trump: Yeah, I doubt it. I doubt it. Trump: She doesn’t like Putin because Putin has outsmarted her at every step of the way. Wallace: You condemn their interference? Trump: Of course I condemn. Of course I — I don’t know Putin. I have no idea. Wallace: I’m not asking — I’m asking do you condemn? Trump: I never met Putin. This is not my best friend. But if the United States got along with Russia, wouldn’t be so bad. Trump: “As far as Japan and other countries, we are being ripped off by everybody in the — we’re defending other countries. We are spending a fortune doing it. They have the bargain of the century. Trump: “They have to pay up. We’re protecting people, they have to pay up. And I’m a big fan of NATO. But they have to pay up. She comes out and said, we love our allies, we think our allies are great. Well, it’s awfully hard to get them to pay up when you have somebody saying we think how great they are. Trump: “So my plan — we’re going to renegotiate trade deals. We’re going to have a lot of free trade. We’re going to have free trade, more free trade than we have right now. But we have horrible deals. Our jobs are being taken out by the deal that her husband signed, NAFTA, one of the worst deals ever. Clinton: “Well, first, let me say, number one, when I saw the final agreement for TPP, I said I was against it. It didn’t meet my test. I’ve had the same test. Does it create jobs, raise incomes, and further our national security? I’m against it now. I’ll be against it after the election. I’ll be against it when I’m president. In fact, the Trump Hotel right here in Las Vegas was made with Chinese steel. So he goes around with crocodile tears about how terrible it is, but he has given jobs to Chinese steelworkers, not American steelworkers…. The goal here is to take back Mosul. It’s going to be a hard fight. I’ve got no illusions about that. And then continue to press into Syria to begin to take back and move on Raqqa, which is the ISIS headquarters. Trump: “I have been reading about going after Mosul now for about — how long is it, Hillary, three months? These people have all left. They’ve all left. The element of surprise. Douglas MacArthur, George Patton spinning in their graves when they see the stupidity of our country…. 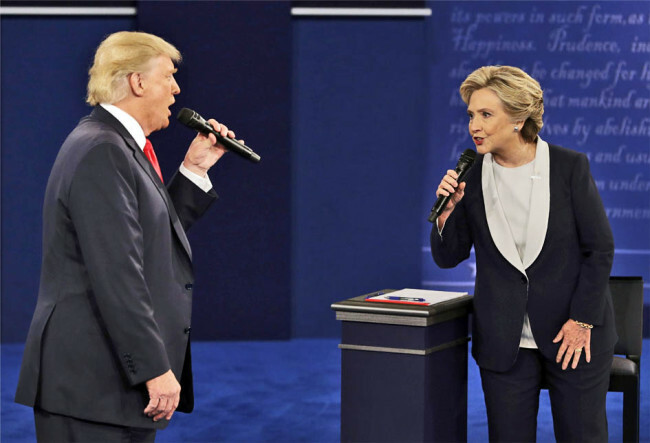 PRESIDENTIAL SECOND DEBATE: RISING BEYOND THE SORDID AND INTO SUBSTANCE? The debate on Sunday night October 9th was one of the most depressing debates on record. The personal invective and behavior of Trump and avoidance of any positive elements or real substance made for an ugly debate and loss of time to address many foreign affairs key issues. This debate only confirmed that this format is a disaster and did not permit the candidates to fully address most of the key issues America and our allies face in a landscape filled with complex choices, instability, nuclear weapons and many high risks. This debate started focusing on Trump’s previous behavior, but the debate made a new low in American politics. Trump brought up sordid elements that debased himself and dominated much of the debate. What it also clearly demonstrated was that Trump is unfit even as a decent human being, let alone fit to be Commander-in-Chief with his finger on the nuclear button. He added “She has tremendous hate in her heart.” He said he would instruct “a Special Prosecutor to look into [her] situation” against Hillary. Trump also invoked extreme religious reference when expressing his shock of Bernie’s support for Clinton as “I was so surprised to see him sign on with the devil.” How does any of this help American understanding of key issues like nuclear weapons or climate change? The thought that he might gain the power to send US forces mindlessly into harm’s way and alienating ourselves permanently through reckless actions, which he has already done from the statements of many key leaders around the world (as seen in our post on Voices Beyond Our Borders), is very disturbing. But his behavior in his personal life has already proved that he has no internal moral core, which should be a vital precondition for anyone to head the American government domestically or globally. His actions as well as his words all indicate that the man is either very stupid or mentally unbalanced. The debate only reinforced this judgement. As for Clinton, on foreign and national security issues, she showed again a command of the issues and the problems the US faces abroad. But there was little time to get into details. The problem with both the questions and the moderators, Anderson Cooper of CNN and Martha Raddatz from ABC, were that once again they did not get into or demand any real depth on most of these issues. Rather they permitted repeated statements by Trump to avoid any questions of his behavior and his substantive policies. They let Trump ramble on off topic statements while cutting off Clinton. This made the debate a bit more one sided than it would be with some real, fair discipline. They let Trump repeatedly interrupt Clinton even as she talked on serious issues. In sum, the candidates were not challenged or forced to reply to the questions asked except in one case, so we lost much insight about topics of great significance. Perhaps the greatest cost of this display of utter coarseness and continued show of hate for much the world’s people especially women, Muslims, Latin Americans and beyond has threatened respect for and willingness to follow our leadership. How can anyone who is a true decent leader look to this brute of a man ever and give any respect or believe in his word? That does not and will not happen with Obama and nor for Clinton. Trump’s dark and brutish gutter talk only deepens fear abroad. His behavior along with his attacks and false accusations only contributed to the sense around the world that America itself has lost its way. People of substance abroad are asking how American politics could produce such a man of such abhorrent quality. Trump cited “stupidity” of our foreign policy, but refused to give much specifics of how or what he would do. There was almost nothing said on nuclear weapons or arms control. The blame lies with the commentators and the networks that ran this debate that avoided real strategic issues and what direction they would take. Trump once again took up terrorism as an attack in response to a question about hate statements about Muslims. Trump brought up again “extreme vetting” again citing the example of the refugees from Syria. Clinton on the other hand made a strong case of accepting Muslims and not discriminating while saying that ISIS would be defeated and Trump played into the hands of terrorists. Clinton defended Syrian refugees while bringing them under tougher vetting. On the question of Syria, Clinton said the situation was catastrophic and noted in the Aleppo bombing there is Russian determination to destroy Aleppo. She reaffirmed the need for a safe zone, that we need leverage over Russia, and to work with partners on the ground. Regarding the aggressiveness of Russia, she said that she stood up to Putin. She added that we should continue diplomacy and would hold Russia accountable for humanitarian crimes. Trump did take up ISIS in the context of Syria and other nations like Libya but did little to enlighten onlookers with specifics of how he would address the multiplicity of terrorism threats. He gave the impression that he would be more aggressive without much specifics on how and at what risk or costs. Clinton did outline how she would deal with ISIS in Syria. She also noted that progress against ISIS was being made in both Syria and Iraq without putting our troops into danger. The coverage of this topic was, except for building “a strong border,” not deeply addressed and neither were the means and costs addressed except Trump said, as he has in the past, keep illegal immigrants out and send them back. There was only very short mentions about Russia and Putin. There was no policy or specific approaches discussed or really asked by the unenlightened and unbalanced moderators. Clinton noted broadly she would be tough on Putin’s aggression. Trump, against reports to the contrary, said he had no interests in Russia. Other documents show Russian investors and his staff included a key advisor who helped the Russian-backed Ukrainian President as a political advisor. When Clinton said he could prove this by releasing his taxes, Trump went on an attack against Clinton not related to Russian influence. Trump again went after TTP and demonstrated he might close much of our trade with large parts of the world. Clinton did not engage in this subject in any specific way. Global poverty and inequality were never mentioned. This topic was never really addressed. The only mention was in relation to the issue of the energy industry. Trump said he would support clean energy but clearly was in favor of expanding coal and other fossil fuels. Clinton argued in favor of using natural gas as a transition to reliance on green energy, which would help address the serious problem of climate change.